I have to admit, I haven’t really made the time to prep many of the images that the team has shot for blog posts. As the key person who handles our social media postings, I need to buck up a bit more to get things going. Most of my time has been spent on meeting potential business partners / clients, shoots, replying emails, helping coordinate other shoots, going for my BNI meetings, and then being a mother. So now that I’ve prepped and sent my kid off to school, I have time before my next meeting for a blog post! Nicolas & Cassandra were wed recently in August, and we are planning to share their images from their wedding on our blog soon. But I wanted to first share their casual 2 hour pre-wedding session that was photographed by Jennifer. 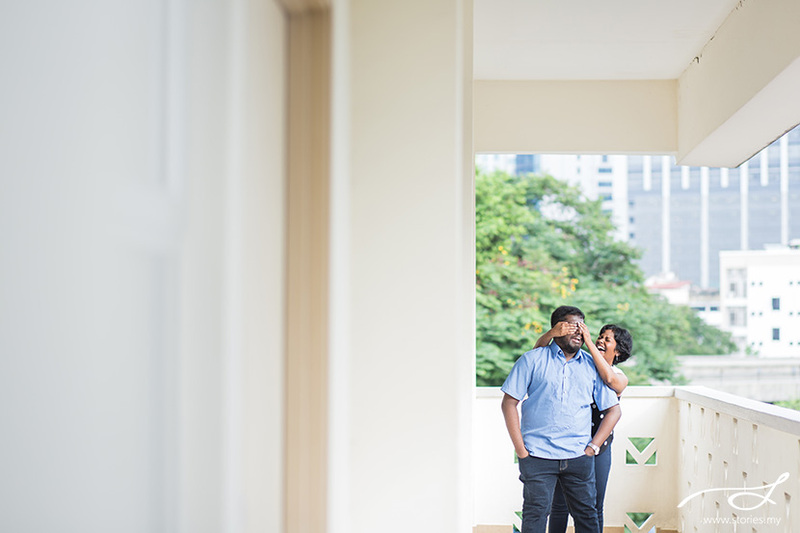 It was a really easy going session as the shoot was held at the place where they met… Methodist College KL. I love how much laughter these 2 share between the both of them. You certainly need huge amounts of laughter and fun to carry you through life as a couple! The inspiration for the shoot came from the location itself, Glamz at Genting. 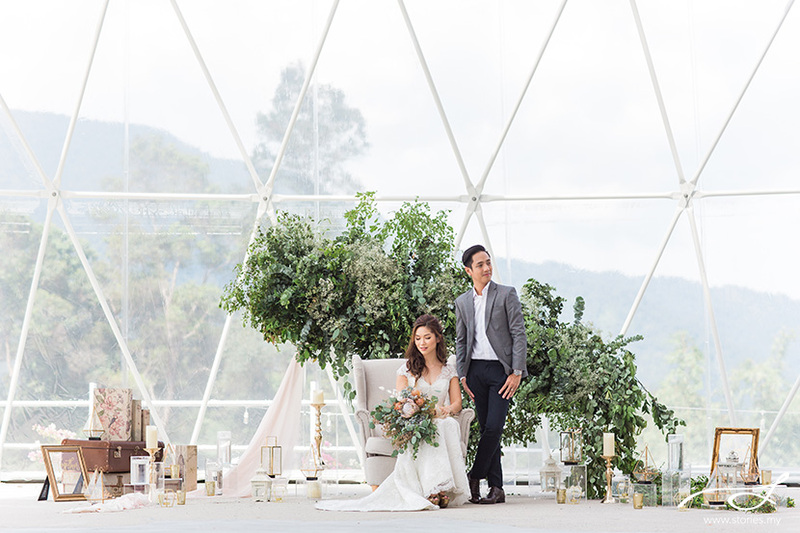 As a new venue with interesting dome like structures and glamping facilities surrounded by scenic mountain views, we were excited to create this styled shoot after the contest with Stories.my & The Wedding Scoop ended. 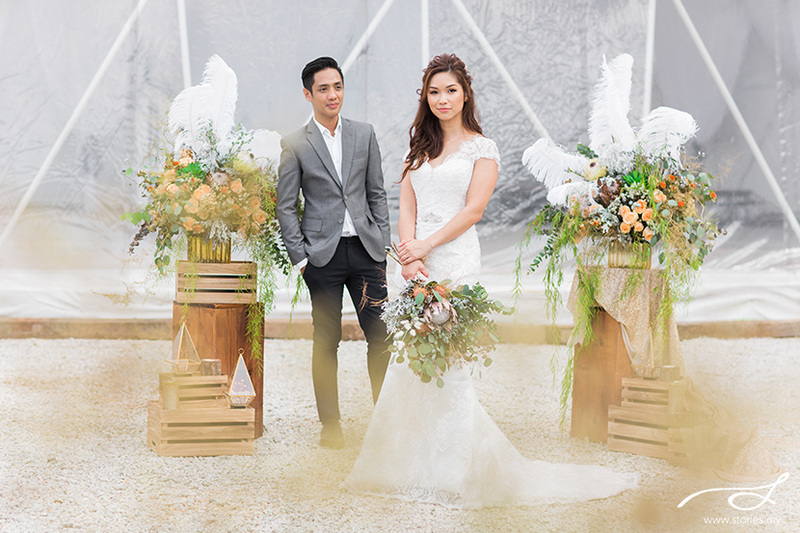 Together with Pretty Little Things, we came up with the idea of a modern, simple styled shoot with a tinge of boho. We wanted to combine glamour with the outdoors. Simplicity with a touch of rawness. The flowers were beautifully designed by Bloom2u. We especially love the bouquet with the unique protea cynaroides flower decorated with eucalyptus silver dollar, eucalyptus baby blue, silver leaves, eucalyptus tetragonia, eryngium, leucospermum and foliages. Pretty Little Things worked together with Bloom2u to come up with a complete styled look for the shoot. 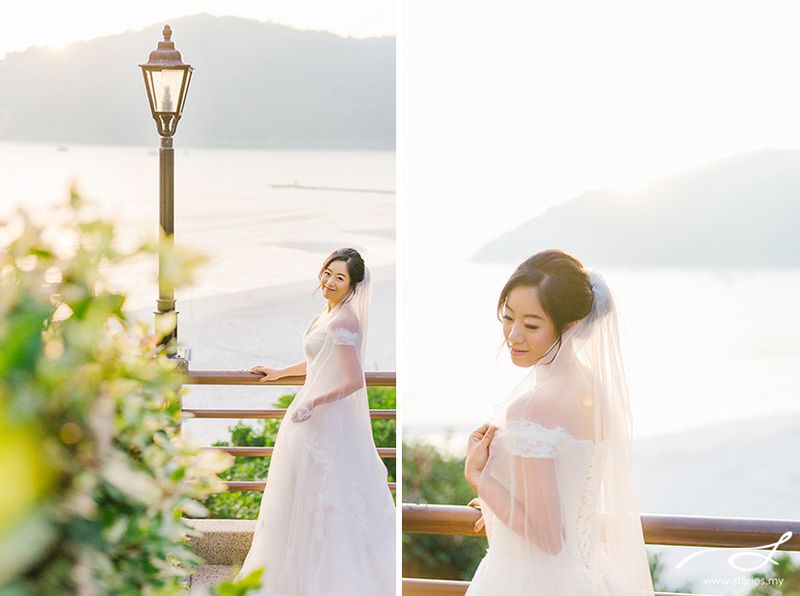 The elegant wedding gown was provided by That White Dress and the look was made complete with hair & make up from SuyenPang Artistry. The end result was inspiring, and made our job as photographers and videographers easy! When we contacted the winning couple, Faisal and Aggie and got to know them better, we realised that they fit the whole theme perfectly. The both of them work in the creative industry, with Faisal owning his own video production company and Aggie as a copywriter in an advertising agency. Individually, they are uniquely different – Aggie is a fitness junkie (she is a part time boxing instructor! ), a meticulous planner and is a bit more cautious in making decisions. Faisal, on the other hand, is more of a risk-taker (For example, Faisal rented a motorcycle in Bali with no licence and minimal experience, something Aggie wouldn’t do), has zero interest in fitness but willingly plays the role of Instagram cameraman to Aggie. Together, they fit like a glove, despite coming from culturally different families. They have such a chill vibe about them, brought together by their love of music, cats, travel and all things creative. After spending 11 years together, they eventually tied the knot in August 2018. So our shoot together was a pretty relaxing one for them, since they had just returned from their honeymoon in the Maldives! 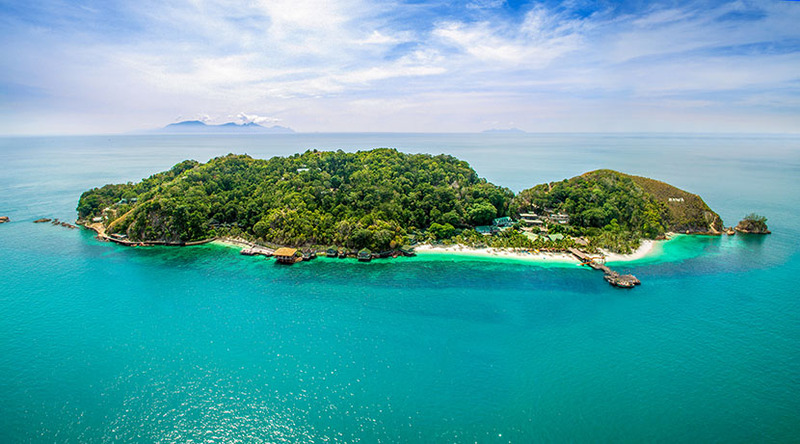 This is a love story that spans across two countries… Malaysia and China. 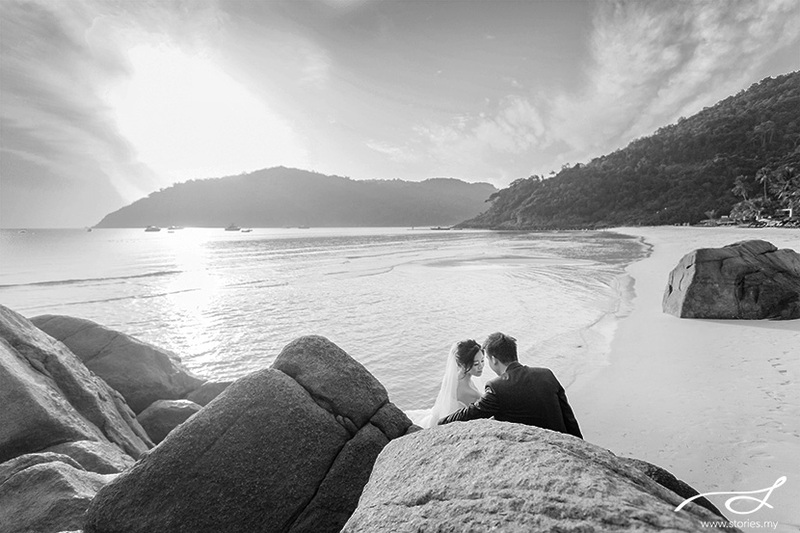 It was Vanilla’s best friend’s wedding in Penang and the 7th time she became a bridesmaid. So Vanilla travelled from China to attend the wedding, not thinking that she would ever find love on this side of the ocean. For the past 6 weddings, she had always rushed to grab the bouquet but this time, the couple specially presented the bouquet to her as a gift. As fate would have it, during her trip to KL after the wedding, she met Jonathan, who was her friend’s younger brother. Her first thought was that this boy was cute! They didn’t really have much time to chat until the day she was due to travel to the airport. Jonathan was tasked to send her to the airport and it was during that loooong ride that they got to know each other. Vanilla was surprised that at the end of that ride, he expressed his love at first sight to her. He immediately hooked her heart that day, and soon, they were messaging each other everyday. Their relationship blossomed despite their age difference with him being younger. 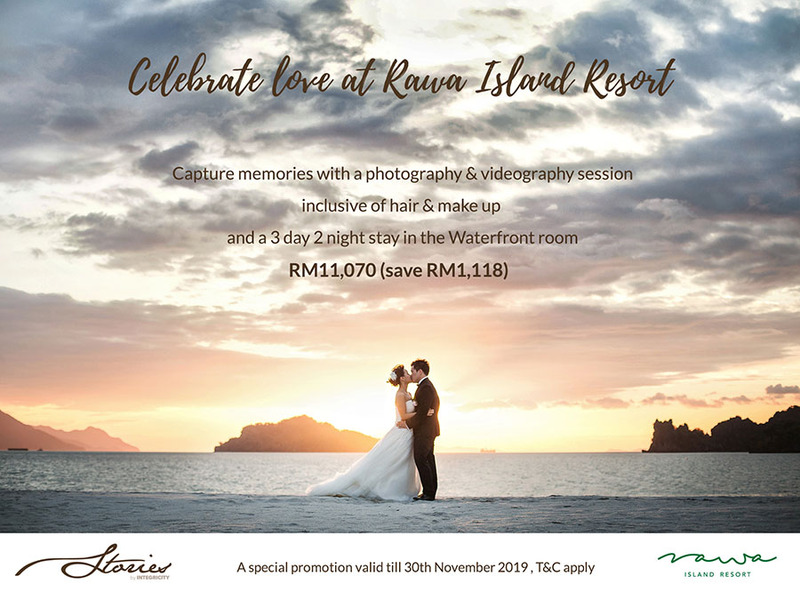 I was privileged to travel with them to The Taaras Beach & Spa Resort on Redang Island for their pre-wedding photo session. Despite the rainy weather forecast, everything went really well and we had a beautiful day together. The couple’s family also came along for the trip, so we squeezed in some shots with them. All the best to the both of you as you start your life’s journey together.